Most people would say they can easily identify dandelion but very few are aware that there are two relatively common species, the red-seeded and the common dandelion. While very similar, they can be distinguished by observing two main characteristics, the leaf shape and seed colour. The red seeded dandelion is a perennial plant in the Asteraceae family. Red-seeded dandelion is native to Europe; it was widely introduced to North America. Distinguishing Features: Features: This dandelion grows from a simple or branched stem-base and a thick, often has a deep taproot; stems are erect, and they grow solitary to large bunches. Like the common dandelion, it exudes milky juice when broken. The leaf margins are triangular and the tips are pointed. Flowers: Flowers are solitary, disk-shaped yellow flower heads, typically 2 to 2.5 cm (¾ to 1”) across, on hollow stalks. 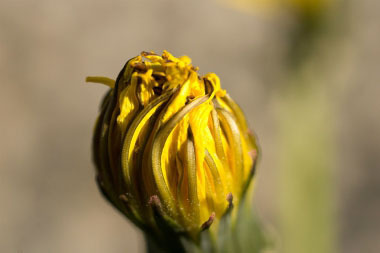 Like the common dandelion, the flowerhead has about 150 to 200 yellow ray florets and no disk florets; the ray florets spread outward from the centre. Around the outside of the base of the disk flowers is a green, receptacle with narrow, lance-like bracts that are glossy and reddish tipped. It is typically in bloom from April to June. The flowers are hermaphrodite. Fields of Nutrition has medicinal benefits and vitamin/mineral content of Red Seeded Dandelion. Leaves: Red seeded dandelion leaves grown in a basal formation. Basal leaves are oblanceolate to lanceolate, 5 to 25 cm (2 to 10”) long, 1 to 4 cm ( 0.39 to 1.57”) wide, tapering basally to a more or less winged stalk, deeply pinnately cut or pinnately divided into backward-pointing, narrow, triangular-lanceolate lobes with segments tapered to a slender tip. In some cases the leaves can be much larger. 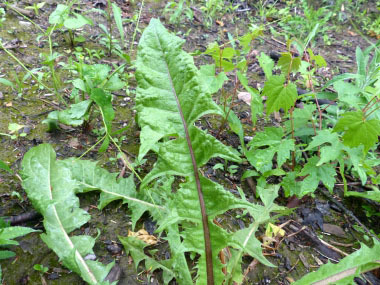 Height: Leaves: Red seeded dandelion leaves grown in a basal formation. 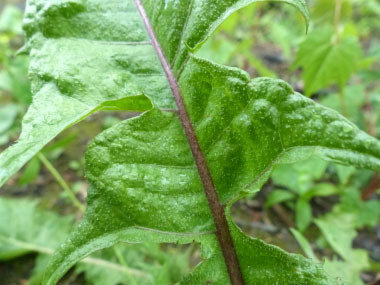 Basal leaves are oblanceolate to lanceolate, 5 to 25 cm (2 to 10”) long, 1 to 4 cm ( 0.39 to 1.57”) wide, tapering basally to a more or less winged stalk, deeply pinnately cut or pinnately divided into backward-pointing, narrow, triangular-lanceolate lobes with segments tapered to a slender tip. In some cases the leaves can be much larger. 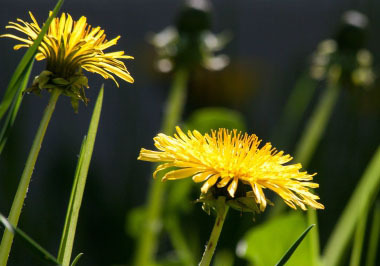 Habitat: These dandelions can be found in areas with part shade, sun; in disturbed soils, along roadsides, in waste areas, and of course on lawns. They grow in almost all conditions from soggy or marshy areas to dry and rocky environments. They are found in almost every state and province as well as throughout Europe, and Asia. 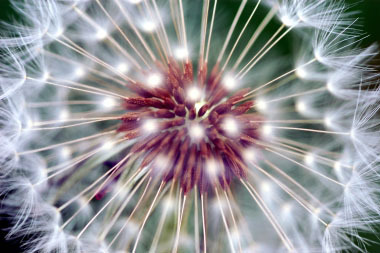 This particular species of dandelion may be found in parts of South America, Iceland, Australia and New Zealand. It has been found on remote sub-Antarctic islands including Crozet Islands, Kerguelen Islands, and South Georgia Island. Edible parts: The flowers, leaves and roots are edible. 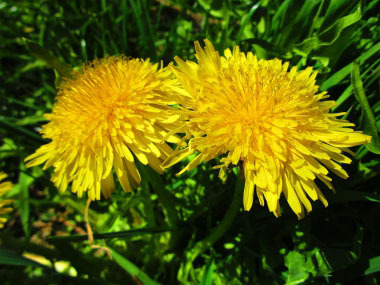 Dandelions are bitter, especially after flowering which makes this plant great for digestive issues and is excellent for liver health.Flowers are used as tea, which are beneficial for eye and heart health. 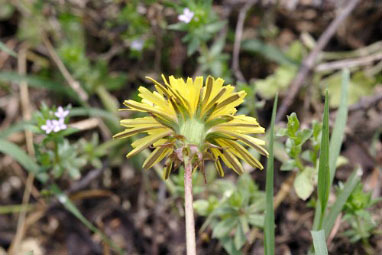 Similar plants: Dandelion, Russian Dandelion.